It was a rainy and cloudy January outside, but inside, the Antwerp Diamond Trade Fair was full of warmth, sparkle, and enthusiasm. Stéphane Fischler, President of the Antwerp World Diamond Centre, explained that 2013 was the second best year ever for the Antwerp diamond industry, with exports and imports up 8 percent. 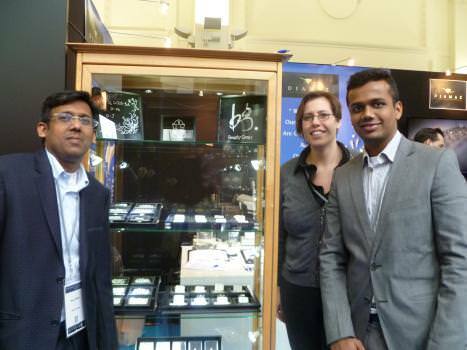 Started five years ago, the Antwerp Diamond Trade Fair (ADTF), held in Antwerp, Belgium, continues to expand. This edition saw the addition of a third hall, the Antwerp Diamond Kring, which joined the Antwerp Diamond Bourse and the Diamond Club of Antwerp in providing an elegant venue for 90 of Antwerp’s leading diamond manufacturing and trading firms. Organized by the Antwerp World Diamond Centre (AWDC)—the coordinating body and official representative of the Antwerp diamond sector—the location of the fair is fitting since 84 percent of all rough and 50 percent of all polished diamonds pass through Antwerp. 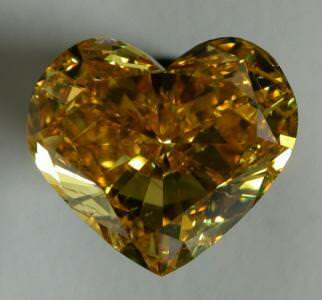 An 8.03-ct natural fancy vivid orangy yellow diamond, by Diarough. 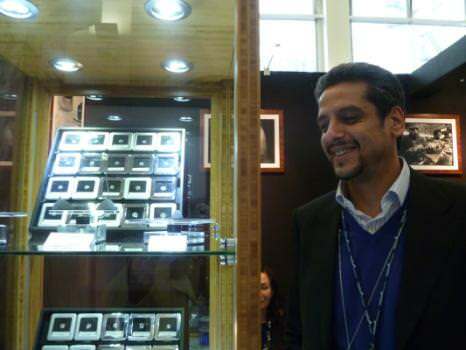 The exhibitors at the ADTF showcased a wide range of diamonds, in all shapes, sizes, and colours—truly something for everyone. One of the world’s oldest and largest diamond companies, Pluczenik featured a range of sizes, shapes, and colours, including several white stones over 100 carats, all cut in the company’s factory in Antwerp. Peter Martin, Communication Manager, explained that fancy colours are also an important part of sales with demand rising over the last three years. Spectacular red diamond, weighing just under a carat, by Antwerp Cut. Another ADTF exhibitor that offered a wide range of fancy colours was Antwerp Cut. 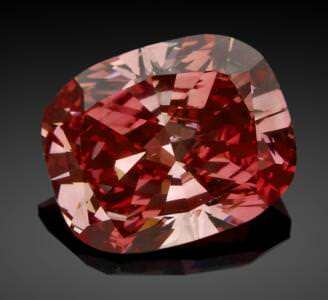 Among its spectacular stones was an extraordinary red diamond. “The rarity and beauty of this natural fancy red makes it a true object of desire, sought after by collectors and connoisseurs,” commented Mike Akiki, Managing Director. He added that purple and orange are also popular hues. 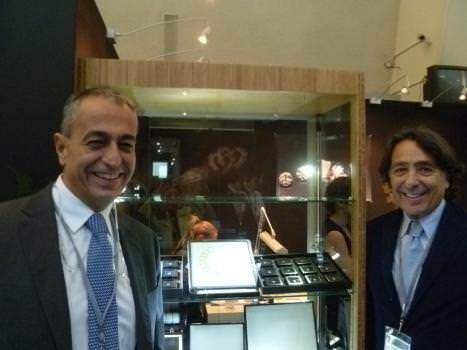 Antoine Haddaq of Diamprest, left, showcased a wide range of pink and yellow diamonds, while Andre Messika, of Messika Diamonds, presented a large range of white diamonds. Moving towards the pink end of the spectrum, Diamprest offered 12,500 natural pink baguettes. “Pinks are selling every day,” said Antoine Haddaq, President, “and are purchased mainly by large Place Vendôme jewellers.” With a focus on colour, the company also featured a number of yellow, green, and blue-grey diamonds. One of the most spectacular coloured diamonds at ADTF was an eight-carat intense blue oval offered by RDH Diamonds, worth an estimated $12 million. Specializing in high-end and investment diamonds of all colours, the company displayed eight white stones worth more than $1 million, four worth over $2 million, two over $4 million, as well as a variety of other diamonds. According to Oded Mansori, owner, “Clients with money buy the best, and we are seeing a wave of wealthy people coming from the Asia/Pacific region who see the highest quality diamonds as good investments.” He further explained that during the financial meltdown in 2008, diamond prices declined, but the top-end diamonds remained stable and some actually increased in value, confirming their status as investment vehicles. While it sells mainly white diamonds, from 5 points to 15 carats, the Dalumi Group, a sightholder, clearly understands the demand for yellow stones, and has created a special division, Golden Diamonds, to sell the entire spectrum of these coloured gems, both loose and in jewellery. Beyond diamonds, as Shmuel Lavan explained, the group is committed to corporate social responsibility and helps Botswana’s local community by sponsoring the Tlokweng SOS Children’s Village, which supports children without parents. 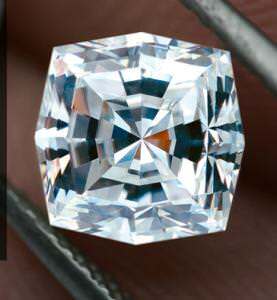 The special WebCut diamond, by Dali Diamond. Another vertically-integrated sightholder is six-decade-old Dali Diamond. Still family-run, the company is a supplier of the ForeverMark™ Diamond, and has also created its own special 48-facetted WebCut™, “offering a minimalist yet intriguing design, based on the flawless work of nature’s major architect, the spider,” declared Charles Hollander, President, who added that the diamond market is picking up. Concurring that the market is now improving, Laurent Grossman, Director of Grossman Diamond Manufacturing, said that this is good news, since the last two years were difficult due to the lower demand. Grossman handles high quality small sizes, 1 to 20 points, used by Swiss watch brands and luxury brands on the Place Vendôme. One of their unique cuts is a star-shaped stone with very specific angles and proportions. A pair of beautiful 15-carat heart-shaped diamonds, by MID House of Diamonds. Unusual shapes are no strangers to MID House of Diamonds. 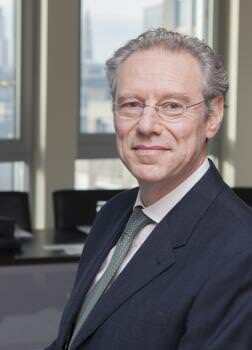 Started in the 1970s by his father, it is now run by David Meirov, and has offices around the world. 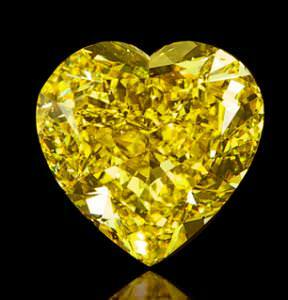 Dealing in all qualities, the brand showcased a pair of 15-carat hearts valued at around $700,000. The most creative logo and diamond-studded promotional decorations were found at the Beauty Gems booth. From left to right are Nirav Shah, Liesbeth Cleen, and Sahil Shah. Expressing satisfaction, too, that the market is picking up, Liesbeth Cleen, of Beauty Gems, stated, “the show has been very good, and ADTF offers a good venue to meet our current clients as well as to make new ones.” Of special interest was the diamond-studded logo and decorations at the company’s booth. Beauty Gems specializes in sizes from 0.005 to 5 carats. Cushion cut, 30.16-cts, G, Internally Flawless, VG/VG, by A.S. Diamonds. 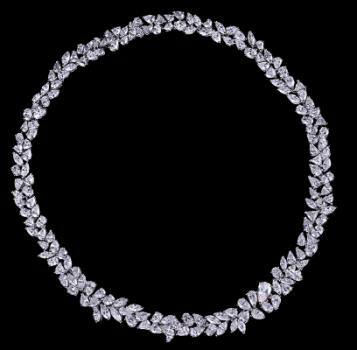 A diamond necklace from the Scintilla brand of fine jewellery, by Trau Bros.
Fifth-generation Trau Bros., a sightholder since 1947, displayed a range of white diamonds, 0.25 to 5 carats, in a variety of shapes, manufactured in Botswana and Namibia. Trau recently entered the world of fine jewellery with its exclusive high-end “Scintilla” brand as well as the “Jade Trau” collection targeting a younger audience. Pini Ringer, Sales Manager, also discussed a new type of grading certificate issued by DeBeers, and limited, for now, to sightholders. 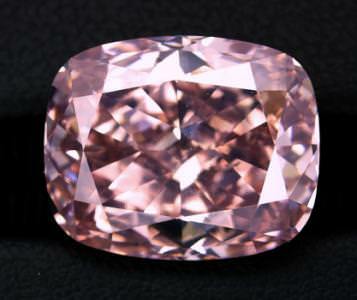 A 12.12-ct Type IIa pink diamond, by Bellataire. Bellataire offered a different product than most at the ADTF. According to Paul Kaplan, Director of Operations, Antwerp, and Oran Hickey, Vice President of Operations, “Bellataire diamonds are extremely rare, ultra-pure diamonds that have been restored to their intrinsic color by a high-pressure, high-temperature (HPHT) process developed by General Electric and Lazare Kaplan.” Because these stones do not contain nitrogen, as do the other 99 percent of the world’s diamonds, they are classified as Type IIa. Some famous Type IIa’s are the Star of Sierra Leone (968.80 carats) and the Jonker (726.60 carats), which are among the seven largest colourless diamonds ever found. Kaplan and Hickey explained, “The extremely rare Type IIa diamonds were originally crystallized without colour, but during their journey to the Earth’s surface through volcanic pipes, the crystals were subjected to intense heat, pressure, and explosive turbulence. These conditions caused molecular misalignment in the crystals, resulting in a brownish color and internal stress. Bellataire’s HPHT process subjects the stone to comparable conditions of heat and pressure, allowing its crystals to return permanently to their proper alignment and their original state.” In addition to its colourless Type IIa diamonds, the company also sells Type IIa stones in such colours as yellow, blue, and pink. The World Diamond Mark was introduced by Ernest Blom, Vice Chairman of the World Diamond Mark Foundation and president of the World Federation of Diamond Bourses and Alex Popov, WDMF chairman. Ernest Blom, Vice Chairman of the World Diamond Mark Foundation (WDMF) and President of the World Federation of Diamond Bourses, introduced the World Diamond Mark at the ADTF. 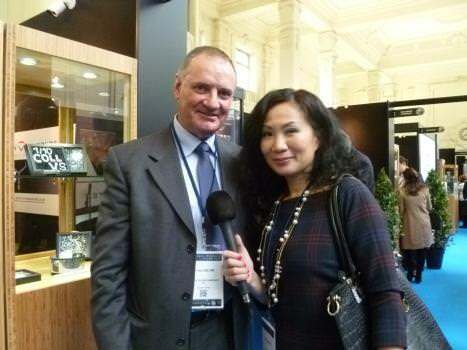 He is being interviewed by Jane Jiang, a television journalist from China.. The WDM is based on three core activities: education of the jewellery retail community through the Authorised Diamond Dealer (ADD) concept of accredited retailers; building consumer confidence through the ADD retailer accreditation program; and generic consumer marketing and promotion of diamonds and diamond jewellery. 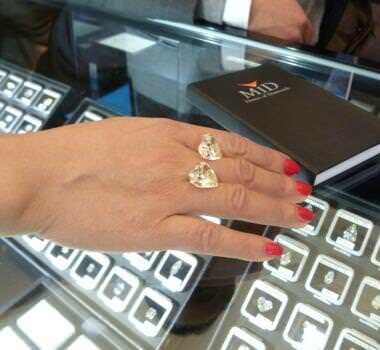 According to the AWDC, 2013 was the second best year for the Antwerp diamond industry. Imports and exports of rough and polished diamonds grew 8 percent for rough and 4 percent for polished. The total value of traded goods was US$55 billion, close to the record US$56.6 billion in 2011, confirming Antwerp’s leadership role as a diamondtrading hub and reflecting its strategy of expanding the industry’s scope worldwide. Its primary market is the USA, closely followed by China. Over the past decade, the average annual diamond production decreased from 160 million carats to a steady 128 million carats for the last three years, while the average price per carat went from US$50 to US$140. The steep increase in rough prices and the consequent decrease of profit margins for diamond traders resulted in a highly competitive environment. 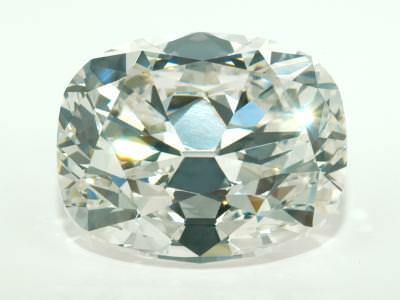 Renowned for its expertise, however, Antwerp clearly benefits from a global trend towards larger, more valuable stones.